Rural women from across Uganda launch the National Land Defense League and declare millet the official food of the movement. The national convening, taking place in rural Alebtong, scared away a UK-based professor who had been attempting to grab several square kilometers of nearby land. Source: Solidarity Uganda Facebook page. I’ve spent most of my short adult life establishing and leading an organization mandated to support resistance movements. 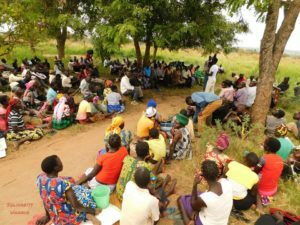 Since 2012, Solidarity Uganda has grown from a local volunteer collective in a remote farming community to an international network supporting grassroots resistance movements in over 70 countries. We’ve helped unionists, students, and rural women fight dictators. Trainees under our umbrella have chased multinational corporations off their land, reversed regressive taxes, and dismissed corrupt leaders. I’ve met many people who are eager to create and develop “resistance capacity-building” organizations like Solidarity Uganda. I hope the below tips—derived from our victories and shortcomings—can assist those walking paths similar to mine, and help progressive funders growing curious about resistance movements understand what to look for in movement-minded organizations. Solidarity Uganda gathering, January 2019. Source: Solidarity Uganda Facebook page. Solidarity Uganda was founded by seven youth from across Uganda while we were still students, but we did not all have the same level of commitment. I was a little younger and certainly more naïve. I thought my passion and skills would fill the gaps left by the less committed members among us. 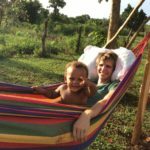 I learned the hard way that one person can’t master law, accounting, marketing, program management, fundraising, recruitment, and the many other duties involved in starting a non-profit venture. Don’t get as burned out as I have. It’s not pretty! Find self-motivated people who can contribute an hour a week toward a specific need—or don’t start at all. Let things collapse where you are spread too thin. Sometimes your comrades need to learn the hard way too. The only way the impact of an organization can scale to national or international levels is through setting up and supporting a network of leaders. They must hold some decision-making power, and their responsibilities must be clear to everyone. Some seemingly “democratic” organizations make the mistake of confusing leaderful organizing with lack of structure, but this quickly degenerates into the tyranny of structurelessness. In the case of Solidarity Uganda, we have a network of regional and industry coordinators. Each coordinator in turn supports a network of volunteer organizers. These networks needn’t ask permission from any secretariat or leadership to carry out actions and campaigns, as long as they fall under our stated values and objectives, which are reviewed and amended by network members annually. Phil Wilmot and members of Beautiful Trouble Africa, from across the continent. Source: Author. One way to decentralize your organization as an institutional leader is to follow Saul Alinsky’s iron rule of organizing: don’t do for others that which they can do themselves. If a task or responsibility, including duties typically associated with directors, like fundraising and marketing, can be delegated, then it should be. In doing so, you’re raising up the next generation of leaders, and giving them space to sharpen their skills even when they don’t succeed. Their ability to deliver will also help you recruit and filter staff, board members, and volunteers. Solidarity Uganda’s founders agreed not to apply for large funding in its early years. We wanted to be able to succeed using only modest contributions from friends and victims of injustice, so as to remain focused on our goals and create a culture of self-reliance. Once we succeeded in dispersing military occupations in one community, we knew we could build our power with or without adequate financial resources. This helped us make much better decisions about scaling up our programs and recruiting staff when more significant funding eventually came on board, eager to help us multiply our achievements. Legitimacy with the grassroots is more important than legitimacy with donors, if impact matters to you. Leaders of your organization must be humble and willing to dig in the dirt—sometimes literally speaking—with those you support. Stay away from large hotels and gas-guzzling vehicles. As much as possible, live with the same conditions as those whom you support. At Solidarity Uganda, we strive for a fairly horizontal and very modest pay scale. For more than three years, none of us took a salary from the organization. Personally, I survived on side gigs through writing, consulting and small business. This forced me to find others who could contribute to our success wherever I didn’t have the time. Famed South African activist Kumi Naidoo, at the launch of the Africans Rising Movement in 2016, cautioned that for formations to be politically efficacious, they must forge a starfish-spider hybrid. “A spider has a head—a lean and mean bureaucracy—and can see ahead and move in the right direction. The problem with the spider alone, is that you chop off its head and it dies. If you cut off the arm of a starfish, however, another starfish forms.” The starfish-spider hybrid seems as apt an analogy as any to me, for those creating impactful movement-minded organizations. 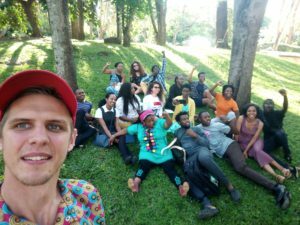 "Cinco consejos para construir una organización de apoyo a los movimientos"
Phil Wilmot is a former ICNC Learning Initiatives Network Fellow, and co-founder and outgoing director of Solidarity Uganda. He reports extensively on resistance movements and is author of A Wolf Dressed in Sheepskin: A White Guy’s Dilemma in a Ugandan Jail Cell. Phil lives in Uganda and can be reached at phil@wagingnonviolence.org.